In today’s highly competitive fashion marketplace, industry professionals at every level need to understand the garment costing reality behind retail prices. The new ASBCI technical handbook, Garment Costing – everything you need to know about the cost of making clothes, brings together the collective knowledge and expertise of the association’s members to provide a step-by-step explanation of the garment costing process and the factors that affect it, from sourcing location to raw materials, production processes, labour costs, and logistics. The ASBCI’s Garment Costing handbook covers the entire process of garment production as it relates to costing. It starts with sourcing, including choice of location and production partners, before examining the complexities of the added-value supply chain – from fluctuations in fibre and yarn costs to weaving and knitting, dyeing and finishing, interlinings and non-wovens, trimmings and accessories, and packaging. It then goes on to look at finished fabric and materials and explains how the processes followed by a typical clothing factory will impact on garment costs. The handbook also provides detailed explanation of how labour costs are calculated, including examples of time and work measurements and average monthly minimum wages of workers in the main apparel sourcing locations (accurate as of December 2017). This is followed by a section on overheads – factory, sales, and product testing, etc – and an overview of the costs of the logistics involved in apparel production, from different methods of freight to warehousing and distribution and freight forwarding. Finally, the handbook covers reprocessing, both planned and unplanned, and summarises the costing process, touching briefly on retailer costs and other financial considerations. In addition, the booklet provides a useful glossary of costing and accounting terms, sample costing spreadsheets, a helpful introduction to and explanation of work measurement, and some cautionary anecdotes that demonstrate how easily things can go wrong. The Garment Costing handbook is available to order from the ASBCI www.asbci.co.uk/publication/handbooks where you can download the order form and return to asbcioffice@asbci.co.uk or telephone 01422 354666 and costs £30 for members and £60 for non-members and £22.50 for student members and £25 for student non-members. The handbook could not have been produced without the valuable contributions from ASBCI members including: Advanced Supply Chain Group, Assyst-Bullmer, Chargeurs Interlining UK, Coats Group, Excelpress, Fashion Enter, High Street Textile Testing Services, Lectra UK, Marks & Spencer, Nottingham Trent University, IMM Associates, and the University of Manchester. 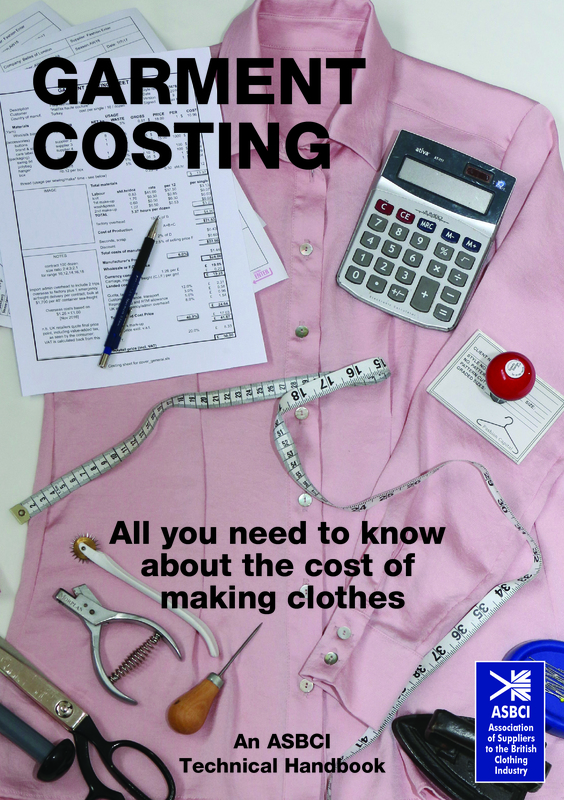 Garment Costing – everything you need to know about the cost of making clothes was published in 2018 by the ASBCI Technical Committee. It was edited by ASBCI Chairman Alistair Knox and Technical Committee chair Ian Morris and includes contributions from numerous ASBCI members. It is one of a series of technical handbooks from the trade association. Other titles in the series include: Caring for your clothes, Size and Fit, Joining Forces, Interlinings, Introduction to Colour, Colour Clues, Tried and Tested, Make or Break, and Wrinkle Free. All booklets can be ordered direct from the ASBCI www.asbci.co.uk/publication/handbooks where you can download the order form and email to asbcioffice@asbci.co.uk or telephone 01422 354666.